by Bryant, Randal E.; O'Hallaron, David R.
Randal E. Bryant received his bachelor’s degree from the University of Michigan in 1973 and then attended graduate school at the Massachusetts Institute of Technology, receiving his PhD degree in computer science in 1981. He spent three years as an assistant professor at the California Institute of Technology, and has been on the faculty at Carnegie Mellon since 1984. For five of those years he served as head of the Computer Science Department, and for ten of them he served as Dean of the School of Computer Science. He is currently a university professor of computer science. He also holds a courtesy appointment with the Department of Electrical and Computer Engineering. Professor Bryant has taught courses in computer systems at both the undergraduate and graduate level for around 40 years. Over many years of teaching computer architecture courses, he began shifting the focus from how computers are designed to how programmers can write more efficient and reliable programs if they understand the system better. 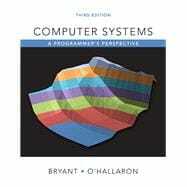 Together with Professor O’Hallaron, he developed the course 15-213, Introduction to Computer Systems, at Carnegie Mellon that is the basis for this book. He has also taught courses in algorithms, programming, computer networking, distributed systems, and VLSI design. Most of Professor Bryant’s research concerns the design of software tools to help software and hardware designers verify the correctness of their systems. These include several types of simulators, as well as formal verification tools that prove the correctness of a design using mathematical methods. He has published over 150 technical papers. His research results are used by major computer manufacturers, including Intel, IBM, Fujitsu, and Microsoft. He has won several major awards for his research. These include two inventor recognition awards and a technical achievement award from the Semiconductor Research Corporation, the Kanellakis Theory and Practice Award from the Association for Computer Machinery (ACM), and the W. R. G. Baker Award, the Emmanuel Piore Award, the Phil Kaufman Award, and the A. Richard Newton Award from the Institute of Electrical and Electronics Engineers (IEEE). He is a fellow of both the ACM and the IEEE and a member of both the US National Academy of Engineering and the American Academy of Arts and Sciences. David R. O’Hallaron is a professor of computer science and electrical and computer engineering at Carnegie Mellon University. He received his PhD from the University of Virginia. He served as the director of Intel Labs, Pittsburgh, from 2007 to 2010. He has taught computer systems courses at the undergraduate and graduate levels for 20 years on such topics as computer architecture, introductory computer systems, parallel processor design, and Internet services. Together with Professor Bryant, he developed the course at Carnegie Mellon that led to this book. In 2004, he was awarded the Herbert Simon Award for Teaching Excellence by the CMU School of Computer Science, an award for which the winner is chosen based on a poll of the students. Professor O’Hallaron works in the area of computer systems, with specific interests in software systems for scientific computing, data-intensive computing, and virtualization. The best-known example of his work is the Quake project, an endeavor involving a group of computer scientists, civil engineers, and seismologists who have developed the ability to predict the motion of the ground during strong earthquakes. In 2003, Professor O’Hallaron and the other members of the Quake team won the Gordon Bell Prize, the top international prize in high-performance computing. His current work focuses on the notion of autograding, that is, programs that evaluate the quality of other programs.